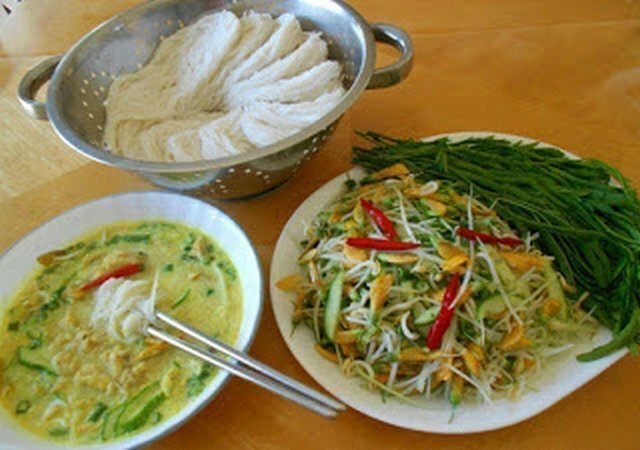 Khmer noodle soup with fish and finger rhizome root is very delicious. Cook 8 cups water in a large pot till water bubbling, add noodle to boiling water and cook till noodle tender. Pour cooked noodle in a colander, rinses under cold water and set it a side to drain. In a large pot, cook 6 cups water till water bubbling, add fish to boiling warer and cook till fish tender. Removed cooked fish from soup pot, put fish in a large bowl and keep soup stock simmering on the stove. Using a fork to breaks down cooked fish to small pieces, set it a side. In a blender, put garlic, finger rhizome root, lemongrass, galanga root,chili pepper, turmeric, roasted rice powder, green onion and 1 cup fish broth, blended well and set it a side. Heat up a skillet or wok. When wok is hot, add oil and prepared spices, stirs, add cooked fish, stirs well, pour it in with soup broth and cook till broth bubbling. Seasoning with fish sauce,sugar and creamy style pickle fish(pahok), simmering for 15 minutes before serve. In a serving bowl, put some mix vegetables( bean sprouts mix with shredded cabbage, cucumber, banana blossom and mint), put some cooked noodle on top noodle and pour hot soup over. Serve immediately.